With only two weeks until rehearsals starts in Lisbon, a great bunch of this year’s participant tested their songs one last time in front of a big international Eurovision audience, before they head to Portugal. Watch the videos from the 2018 edition of the big Eurovision In Concert. It’s hard to imagine that we are just a few weeks away from the Eurovision Song Contest kicking off in Lisbon. On Sunday, the 29th of April the first rehearsals will start. For participants, delegation members, press and fans, it will be a couple of intense weeks in the Portuguese capital. Rehearsals, press conferences, fan meetings and parties will be on the schedule, hopefully together with a bit of sightseeing. Before heading to Lisbon, they had the opportunity to perform in front of a big enthusiastic crowd in Amsterdam. 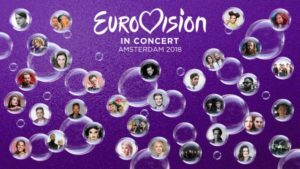 Eurovision In Concert held their 10th anniversary in the larger AFAS LIVE venue with a capacity of 6,000. Edsilia Rombley (The Netherlands 1998 & 2007) and Dutch commentator since 2004 Cornald Maas hosted this year’s Eurovision In Concert. 1986 winner Belgian Sandra Kim performed as special guest and as so-called support act we saw Maxine & Franklin Brown who represented The Netherlands at the Eurovision Song Contest in 1996.